Orig. by controlled cross (unknown parents) made by C. Forkert, Ocean Springs, Jackson County, MS. Parentage of Forkert’s first introduction, ‘Dependable’, was ‘Jewett X ‘Success’. Similiarity in appearance led to speculation that ‘Desirable’ is a sibling. Another controlled cross by Forkert, ‘Admirable’, was ‘Russell’ X ‘Success’. That parentage has also been suggested for ‘Desirable’. Isozyme analysis is consistent with ‘Russell’ X ‘Success’ parentage, while the genotype of ‘Jewett’ remains undetermined. Cross made in 1903. Introduced by Forkert as ‘Desirable’ in 1914, but not widely distributed until after Forkert’s death in 1928, when USDA-ARS, Philema, GA, tested it as # 7191, beginning about 1930. Identified by USDA as Forkert’s ‘Desirable’ in 1936. 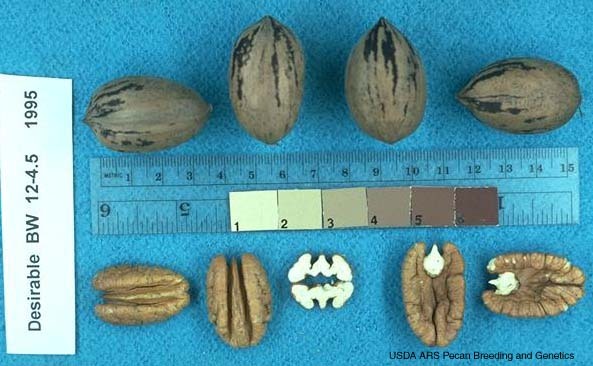 Nut: elliptic with obtuse apex and obtuse to rounded base; round in cross-section; shell rough, with elevated suture; 38 nuts/lb, 54% kernel; kernels golden in color, with wide dorsal grooves. Protandrous, with abundant early pollen shed and mid- to late- season pistillate receptivity. Bears in about 6 years and makes consistent, moderate production of high quality nuts, due in part to self-thinning fruit drop that reduces the number of nuts per cluster. Ripens in late mid-season, shortly after ‘Stuart’. Susceptible to scab. Extracted from here.